Study Paganism and magical practice for any length of time, and at some point, you’re going to hear about correspondences. Often we discuss correspondences, which are tangible things associated with non-tangible aspects, in terms of herbs, crystals, even planets. Oddly, there’s occasionally a tendency to overlook one of the most useful sets of magical correspondences: metals. The use of metals as magical correspondences is hardly a new concept. Delve into any of the older occult books, and you might encounter references to the seven noble metals of the ancients or seven metals of antiquity. Until the discovery of arsenic in the thirteenth century, humankind, as a whole, had discovered and was utilizing seven metals: gold, silver, copper, tin, iron, lead, and mercury. Alchemists assigned planetary correspondences to each of the metals they used. Let’s take a look at seven magical metals, and talk about how you can use them in your practice and workings. Gold is the metal most commonly associated with the sun, and people have given it attributes of everything from personal growth and accomplishment to financial success and power. It appears in nearly every culture, and almost always is a symbol of wealth and status. In ancient Egypt, gold was used to represent the sun and the power that came along with it. If you were a pharaoh, you were a descendant of the gods, and therefore the ruler of the skies and heavens. One of the largest caches of gold from the ancient world ever discovered turned up in Egypt when, in the 1920s, an archaeologist named Howard Carter stumbled across the tomb of a pharaoh that few had ever heard of: King Tutankhamen. Gold appears in the stories of the Greeks and Romans as well. King Midas had the magic touch, and everything he got his hands on turned into gold… including his beloved daughter. On a physical and scientific level, people have spent a lot of time trying to understand the mysteries of gold and all of its properties. For quite some time, alchemists worked fervently to turn other metals into gold, and were spectacularly unsuccessful. Most gold sold in stores these days is an alloy, so keep in mind that if you’re looking for pure gold, you’ll need to go with the 24k variety. Professor George Kauffman (Department of Chemistry, California State, Fresno), The Role of Gold in Alchemy. Charlotte Behr, University of Roehampton, The Symbolic Nature of Gold in Magical and Religious Contexts. Silver appears in a number of magical traditions, and often is considered a neutral metal. It’s typically associated with moon magic, and all that comes along with it, such as intuition, wisdom, and psychic sensitivity. If you’re trying to develop your psychic skills, consider a bit of silver jewelry to enhance your efforts. Silver is typically connected to the sixth chakra, and can be used to help open up your third eye. In other magical systems, silver is considered a reflective sort of metal, not just physically but on a metaphysical level. It is said that silver can reflect negative energy and help prevent psychic attack. While gold is known as a symbol of power and dominance, silver is typically seen as representative of truth and trust. If you give someone a gift of silver jewelry, it’s a valuable thing indeed, far above the monetary aspects. Human beings first discovered copper around ten thousand years ago, and once they figured out how to melt it and shape it, all kinds of things were possible. Copper smelting was discovered around the beginning of the Neolithic era, and has been traced to several different parts of the world at around the same time. Remnants of copper mining and shaping have been found in West Africa, China, the Middle East, and the United Kingdom. The Greeks referred to copper as aes Cyprium, because they mined it on the island of Cyprus (which is pronounced kup-ros). Since Cyprus was known as the birthplace of Venus, the goddess of love, copper is often associated with her, and with the planet Venus as well. One of the most fascinating aspects of magical correspondences is that often an item’s metaphysical properties match up its tangible, physical ones. For instance, in the engineering and science worlds, copper is used as a conductor of electricity and heat. It allows the flow of a current back and forth. So, if copper can transfer energy in one direction or another in your home or workplace, guess what one of the metaphysical associations of copper will be? If you said energy conduction, you’re exactly right. Copper makes an excellent addition to a magical wand or staff, but if you can’t find or make a copper wand, don’t worry. Take the wand you’ve already got, and wrap it in copper wire. Many people believe that this will give you a bit of a magical boost. Like several other metals, copper is also associated with currency and financial well being. During the early Roman period, unrefined lumps of copper were used as money. By the time of the Caesars, however, Roman engineers had figured out how to blend copper with other metals to form alloys, and if you were an emperor, it became a mark of prestige to have coins minted with your own face on them. Today, you don’t have to make your own coins, but if you place a few pieces of copper in your kitchen, it is said to bring money your way. Finally, you can use copper in healing magic. Have you ever seen those little copper bracelets that people wear, that are supposed to help with aches and pains? There may or may not actually be any science behind that, but on a metaphysical level, many people swear by it. Tin is associated with Jupiter, both the planet and the Roman god. It’s shiny and malleable, and the Romans called it plumbum album, which translates to “white lead.” They used it for making mirrors, and even coins. Tin is often used in alloys, being blended with other metals to make something new. Because it resists weathering and corrosion, its alloys can be used in a number of applications; tin items discovered in shipwrecks or buried underground appear almost new, because it doesn’t oxidize. For magical uses, tin is often associated with sexuality and the sacral chakra, so it can be used in rituals to attract the things you desire most. Success and prosperity, abundance, and healing energy–particularly rejuvenation and regeneration–are often tied to tin, which, on a physical level, acts as a bactericide. In some belief systems, lightning is associated with tin. Lightning bolts are a symbol of the god Jupiter, so items charged during a lightning storm can be potent magical tools indeed. Because tin naturally has some awesome acoustic properties, it’s often used in the making of bells and musical instruments. If you’re using healing sounds in your rituals, consider adding tin bells or bowls. Iron is often associated with the earth itself, but it’s also connected with the skies and the universe, because it is found in stars and other celestial bodies. Because iron in the earth is often the result of crashed meteorites, it truly is a metal that reflects the ideology of “As above, so below.” Use iron in grounding rituals and workings, or if you’re heading in the opposite direction, use it for astral travel or shamanic journeys. Many iron ores are actually oxides, and the heavy dark variety is the most commonly found. Hematite is a great example of this; iron itself is associated with protection, and many people carry hematite stones in their pocket as a magical safeguard. Horseshoes and other iron items can be hung around your home to create a magical barrier against those who might do you harm. Iron is associated with the planet Mars, as well as the deity by that name. Keep in mind, Mars was a god of war, and so iron is an almost archetypical representation of the warrior, of power, and of courage. Early weaponry was made from iron ores, and much of mankind’s conquest and control of the natural world is rooted in our ability to manipulate iron. 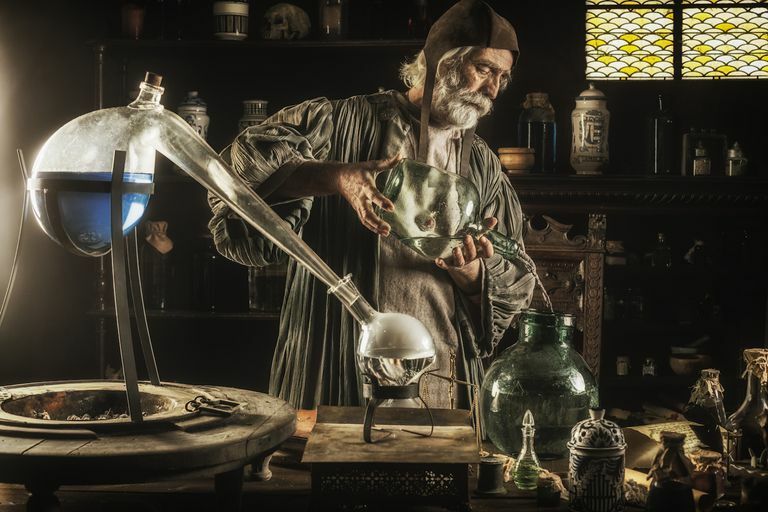 Early alchemists recognized lead as the heaviest of the base metals. It was associated with the planet Saturn, and the god of the same name. It’s not especially pretty, tends to block out light and sound, and is a poor conductor of energy and electricity. Lead is not only heavy, it’s also durable and hard to change. Lead items found in archaeological excavations are usually still unbroken after thousands of years, and many European cities are still using some of the lead piping that was installed by the ancient Romans. For centuries, alchemists were convinced they could turn lead into gold. It’s associated with fire, and melts easily over an open flame. Once burned down, the lead is replaced by a fine yellowish ashy powder, which is why alchemists believed that lead and gold were so intricately connected. Lead is the metal of transformation and resurrection. Magical uses of lead include rituals that focus on connection with your deepest unconscious self, meditation, and stability and grounding. You can also incorporate it into workings to control negative behaviors and thoughts, break your bad habits, and overcome addictions. Finally, if you’re doing any work that involves communication with the underworld, lead is the perfect metal to use. Mercury, also called quicksilver, is one of the heaviest metals known to mankind, and at room temperature, it oozes about in a liquid form. It was known as mercurius vivens, or “the living mercury,” because even though most metals begin as liquids deep in the earth, mercury is the only one whose final form is still in motion. Found in tombs in China, Egypt, and India dating back several thousand years, mercury was eventually used in healing medicine. The Greeks figured out that it could be applied to skin conditions, and in the Middle Ages it was discovered to be an effective cure for syphilis. Unfortunately, it was also used in women’s cosmetics, which eventually proved to be fatal. Mercury is a bit of a weird anomaly when it comes to metals, and is unlike any of the others. Since it’s not hard or malleable, it can’t be scratched, shaped, or bent. It doesn’t conduct heat, but it does react to it, and will expand and contract based on temperatures–that’s why it’s used in thermometers. When it’s frozen, it actually works as an excellent conductor of electricity. Because it appears as a living, breathing thing in constant motion, mercury is sometimes associated with the serpent. It’s symbolic not only with the life force itself, but also with the aspects of death and decomposition–remember all those ladies who used mercury in cosmetics? Because mercury is dangerous to use, when it comes to magic, it is typically replaced by either silver or mercurial archetypes. Magical workings involving mercury include communication and progress–after all, the god Mercury was a fleet-footed messenger–as well as mental clarity, higher learning and education, and the ability to be a persuasive and convincing speaker.